The Bureau of Traffic Maintenance falls under the Department of Engineering, Public Works & Facilities. 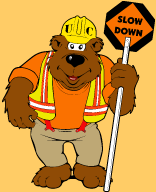 The bureau maintains the traffic signs & striping along 170 miles of County roadway. In addition, it also designs & implements traffic control work zones, collects traffic movement data, provides other county divisions with custom signs and vehicle markings and provides support for other divisions’ projects and interfaces with the County’s twenty-one municipalities through co-op purchasing & shared services. The Bureau maintains a fully equipped Sign Shop that provides the sign fabrication and installation needs of the Bureau and the needs of various county agencies as well as mutual aide assistance to the county’s 21 municipalities. The sign shop also has the capability to provide custom signage for special events and produce vehicle markings for the county’s vehicular fleet. The Bureau maintains a fully equipped Line Striping and Marking operation. The Striping crew provides the Bureau with the capability for centerline striping, traffic marking application and parking lot striping. Striping services are also provided to many municipalities under the Mutual Municipal Aid program. The Bureau collects and maintains records of traffic volume, vehicle speed, vehicle class, turning movements and pedestrian volumes on county roads. Information and technical assistance is also provided to municipalities and other County agencies. The Bureau maintains a supply of necessary traffic control equipment and has experienced traffic control technicians that develop, review and implement traffic control plans for many of the department’s projects. Assistance to municipal police departments for emergency traffic control is also provided. The Bureau has personnel with experience in conducting pedestrian, intersection and traffic studies and investigations in order to determine ways to improve safety for all county road users and makes recommendations to the County Engineer on corrective action. It also supports the engineering staff in project design phase and inspection of construction projects.